Egg Puri | Simple and Delicious ! my name is reem, from perinthalmanna. settled in dubai...bcoz of you my entry to kitchen is grt...i love cooking and ur site helps me a lot..as i dont get chance to communcate with my mom every time. 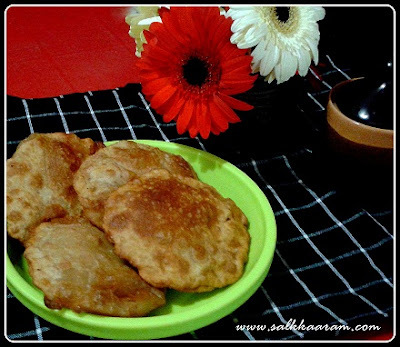 my small doubt as i read the recipe- when u pour raw egg mixture into puri will it get fried??? Hope you can do it.. Keep visiting..
Wow, now this is definitely a recipe that I've not seen anywhere else. I'm so pleased that it doesnt't involve meat, because I can make and eat it too! I love your blog even though I'm vegetarian :) I've made a couple of your Eid dishes for my husband, who's English and non-vegetarian, and he really enjoyed them. Thank you. 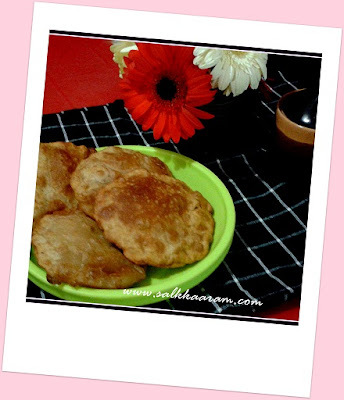 hai seena...h r u..really ur blog s ammmmmazing...actually my son wants puri alone for his breakfast everyday.... u hav any other different varieties in puri wch s healthy too..? thanks n advance...keep rocking..!! !